A combination of warm sea surface temperatures and a weak or absent El Niño may create conditions conducive to tropical storm formation. It’s time to get prepared. 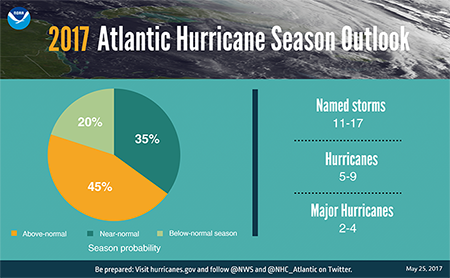 Scientists at the National Oceanic and Atmospheric Administration (NOAA) predict higher-than-normal hurricane activity for the 2017 Atlantic hurricane season, which lasts from 1 June through 30 November. Specifically, NOAA scientists predict a 70% chance of 11–17 named tropical storms this season. Five to nine of those storms may become hurricanes (with wind speeds above 119 kilometers per hour), of which two to four may become major hurricanes, meaning category 3 or higher (with wind speeds above 179 kilometers per hour). What conditions might bring on this heightened hurricane season? Warm sea surface temperatures and low vertical wind shear across the tropical Atlantic Ocean and Caribbean Sea may contribute, plus a weak or nonexistent El Niño, said Gerry Bell, lead hurricane forecaster at NOAA’s Climate Prediction Center in College Park, Md. He and other government officials discussed NOAA’s 2017 hurricane outlook and urged storm readiness at a briefing for reporters at the center yesterday. Hurricanes can’t form without warm air, and that warm air comes from a warm ocean surface. 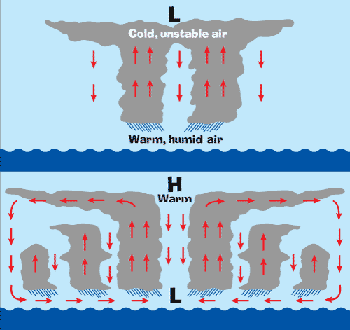 When warm ocean water evaporates, the water vapor rises, cools, and condenses, forming large clouds. In the Atlantic, wind blows westward, and the continued contact with new sources of warm water creates a thick pool of these storm clouds. Condensation releases heat, which warms the surrounding air as the clouds form. This warmed air is pulled back into the column of clouds, where it rises and condenses yet again. This cycle repeats, forming a larger and taller column of clouds. The tops of these clouds expand as more and more water droplets coalesce, forming a classic anvil shape. As more air is sucked into the clouds, air pressure at the surface of the ocean drops. To fill this void, air from the edges of the expanded cloud tops rushes down, where it’s warmed again by the ocean’s surface and rises. This process repeats over and over, fueling the storm. The wind then whips these clouds around a central point, and if winds get strong enough—about 119 kilometers per hour—the storm is classified as a hurricane. Why do researchers forecast high hurricane activity in 2017? This season, researchers predict near-average or warmer-than-average sea surface temperatures across the tropical Atlantic Ocean and Caribbean Sea, enough to provide ample fuel for big storms. What’s more, winds over the Atlantic are not expected to have as many different speeds or directions at different altitudes. This below- or near-average vertical wind shear means that columns of air above the ocean surface, even those within storms, may not dissipate. Instead, the gathering storm is likely to grow. By contrast, high vertical wind shear can “rip apart” a growing storm, Jennifer Collins, a climatologist at the University of South Florida in Tampa, told Eos. In general, a strong El Niño leads to strong vertical wind shear, helping to suppress storms, Collins said. So this year’s weak or nonexistent El Niño could decrease the wind shear and foster storm growth. NOAA also weighed in about Pacific Ocean hurricanes, generally known as tropical cyclones. The agency forecasts 80% odds for a near- or above-normal season in both the central and eastern Pacific Ocean regions. For the eastern zone in particular, the agency calculated a 70% probability of 14 to 20 named storms. Of those, 6 to 11 are expected to become hurricanes, including 3 to 7 major ones. Officials from NOAA and the Federal Emergency Management Agency (FEMA) stressed the importance of preparedness ahead of the hurricane season. They encouraged people who live in hurricane-prone areas to create emergency plans, home safety kits, and evacuation plans. Click here for hurricane preparedness tips. Citation: Wendel, J. (2017), Scientists predict active hurricane season, Eos, 98, https://doi.org/10.1029/2017EO074727. Published on 26 May 2017.